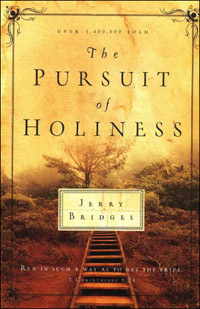 The Pursuit of Holiness by Jerry Bridges is a stirring book on the need to pursue holiness in the Christian life. This compelling book will encourage Christians to practical holiness with God. I have read this book personally and I have found the book informative and very practical. It is a book that will inspire you and challenge you to increase your pursuit of holiness with God. J.I. Packer writes, "This classic still makes one think, pray, get real with God, repent and find joy in wise obedience more effectively than any other book I know. i cannot recommend it too highly." John MacArthur writes, "The Pursuit of Holiness richly deserves to be regarded as a modern classic. Jerry Bridges despels some dangerous misconceptions while motivating readers with a passion for true holiness. This is surely one of the most important books producted in the past fifty years." R.C. Sproul writes, "When Jerry Bridges speaks, I listen. His teaching on holiness is not an exercise in abstraction; it is an expression of a passion that has gripped his life and ministry." After reading and studying The Pursuit of Holiness by Jerry Bridges, I decided to summarize the seventeen chapters in my own words so that I could share the practical applications with others who saw a need to increase the pursuit of holiness in their lives. Chapter 1 - Holiness is for Your: Holiness is for You looks at why many Christians do not experience personal holiness in their daily walk with God and why many Christians feel constantly defeated in their struggle with sin. Chapter 2 - The Holiness of God: The Holiness of God is the basis on which God called us to be holy. "Be Holy because I am Holy" (1 Peter 1:16).